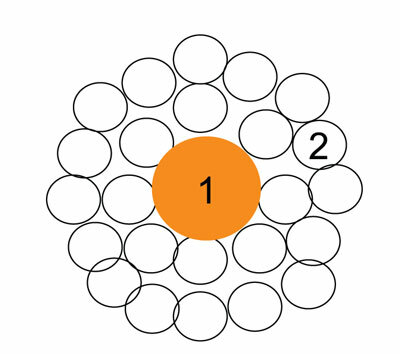 Figure 1: Schematic showing a metallic fiber a few millimeters thick (1) twisted with untreated polymeric fibers (2). SPNano has developed a low-cost method for creating conductive polyester yarns with tunable resistance. Natural or man-made textiles act predominantly as insulators. Conductive textiles are created by either coating a nonconductive substrate with electrically conductive elements or by embedding the conductive material within the substrate. These textiles are then used in antistatic applications, for electromagnetic interference shielding and infrared absorption, or in protective clothing for people working with explosives, among other applications. Wearable electronics bring a new application for conductive textiles, which can be found in sports and healthcare sectors where body conditions are monitored to provide health information. The wearable device market is predicted to reach $20.6 billion by 2018.
the textiles are not biodegradable and therefore are not environmentally friendly, which is an important factor to consider for post-consumption. Other less popular methods for producing conductive yarns and fabrics include printing/depositing conductive polymers, printing metallic inks on the surface, plasma deposition on the threads, and electroless plating. 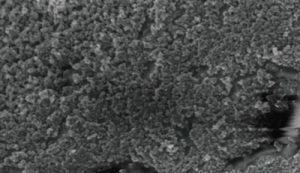 Researchers at Israel-based SPNano Ltd. have developed a new technology for electroless copper coating of polyester (PET)-based textiles. The technology is based on nanometric dispersion of carbon black (CB) and palladium salt nanoparticles using a recombinant protein called SP1. 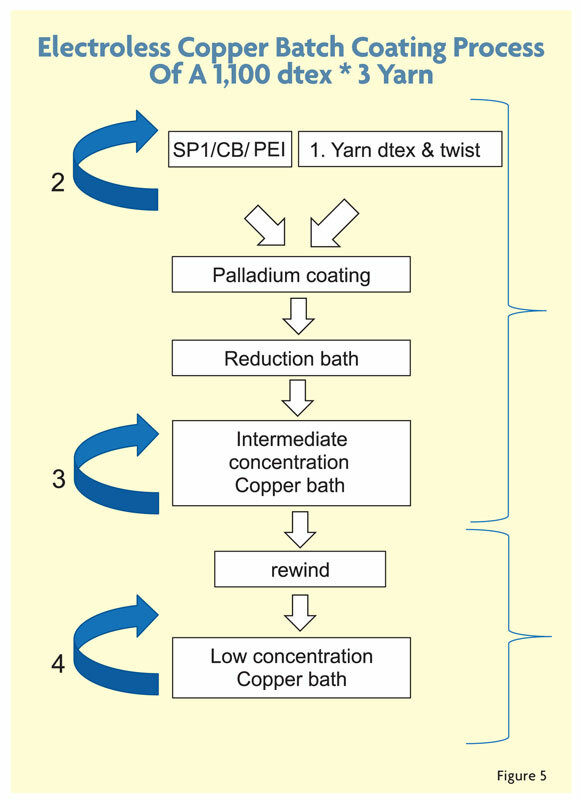 Coating the yarn with the SP1/CB/Pd+2 complex followed by a reduction step to form SP1/CB/Pd0 allows efficient copper deposition on the polyester’s surface. The technology has been demonstrated in industrial settings using several fibers including polyester, nylon and Kevlar®. The yarn is protected from abrasion by a polymeric coating. SP1 is an exceptionally stable protein originally isolated from poplar plants. The sp1 gene was cloned and the protein now is expressed in bacteria by means of fermentation. The protein forms a ring-shape homo-dodecameric particle with the 12 N-termini facing the central cavity. 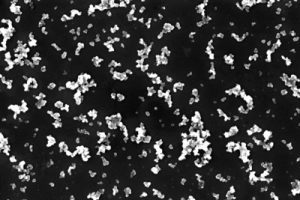 The protein’s exceptional stability allows development of an inexpensive production procedure for industrial applications. Genetic engineering was used to fuse material specific peptides to SP1. Display of twelve copies of such peptides confers the high binding ability of the protein to a variety of materials. The same principle was applied to construct a modified SP1 variant, capable of forming reversible and non-covalent molecular associations with carbon-based nanoparticles (CNPs) — such as carbon nanotubes (CNT), CB and graphene nanoparticles. When SP1 forms a stable nanometric CNP dispersions it can bind to polymer fibers such as polyester. Sonication was used to make a stable SP1/CB dispersion by applying sound energy to N326 carbon black with the L3SP1 protein. The maximum SP1/CNP dry weight/weight ratio was 1:7, and the maximum SP1/CB concentration was 14.5 percent. Stability upon centrifugation was used as a quantifiable measurement of dispersion quality. The supernatant fraction of CNP remaining upon centrifugation was greater than 70 percent. The dispersion was stable for several months at room temperature. Figure 2A shows a high-resolution scanning electron microscope (SEM) image of the nanometric SP1/CB dispersion. The polyester yarn was coated with the nanometric SP1/CB dispersion using a yarn batch dyeing machine in water-based solutions under mild pH and temperature. Screening for optimal coating was conducted using a coating machine from Italy-based Ugolini S.r.l. featuring 100 gram bobbins. The SP1/CNP loading was controlled by the number of binding cycles. Figure 2B shows a high-resolution SEM image of the polyester yarn coated with the SP1/CB dispersion. Coating with the SP1/CB dispersion dramatically increases the yarn surface area and its reactivity with palladium ion. Electroless or chemical plating is a metal deposition method that does not involve the use of external electric energy. It involves a chemical reduction oxidation reaction in an aqueous solution for metal deposition on a non-conductive substrate. 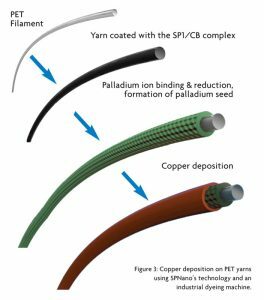 A high-performance polymer filament such as PET was used as the substrate for copper coating, which results in an electroconductive, yet flexible polymer/metal hybrid yarn. In this case, the yarn is activated by introduction of a palladium seed, followed by the copper deposition by using a commercial copper salt solution. One of the major drawbacks of this method is the high cost of palladium — at least $15,000 per kilogram (kg). For commercialization, the amount of palladium should be as low as possible using a cost-effective application method. 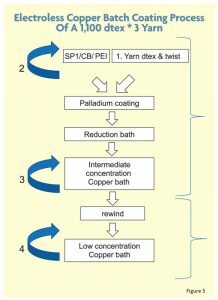 Figure 3: Copper deposition on PET yarns using SPNano’s technology and an industrial dyeing machine. All steps in SPNano’s process are conducted using a batch yarn dyeing machines. First yarns are coated with the SP1/CB complex, followed by its immersion in a Pd+2 solution. A reduction step converts Pd+2 salt to form the active catalyst Pd0, leaving Pd nanoparticles on the surface of the yarn. Upon addition of the copper solution, the Pd nanoparticles initiate the electroless copper deposition reaction. The role of the coated SP1/CB coating is to provide Pd binding sites because pristine yarns or protein-treated yarns do not allow electroless coating under these conditions (See Figure 3). Since palladium is the most expensive part of the electroless copper process, it was important to reduce its quantity without affecting the yarn quality, particularly with respect to plating coverage. During the research, it was demonstrated that SP1/CB coated yarns display a high affinity for Pd. Using an industrial yarn dying machine and low concentrations of palladium salt Na2PdCl4 (1mM, 7 millimoles/kg yarn) achieves high-resistance yarns without any loss in coverage. Application of lower palladium concentrations leads to higher electrical resistance but also uneven copper deposition. In addition, mixing other divalent solutions such as copper (II) chloride with palladium ions leads to higher electrical resistance, indicating competition on limited binding sites. To further thicken the copper coating layer and improve uniformity, PET yarns were coated repeatedly, allowing more copper to attach to the fiber’s surface. However, there is a limitation on improving the resistance because a thick conductive copper coating above 3 microns reduces the flexibility of the yarn and leads to the creation of copper flakes. 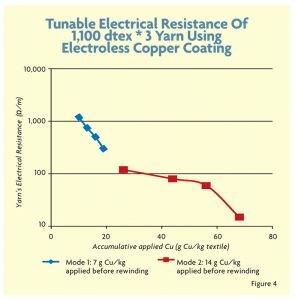 Figure 4 shows the electroless copper coating method in more detail using a 1,100 decitex * 3 yarn with high twist. Yarn decitex and twist — with equal copper deposition levels per kilogram, high decitex yarns display lower resistance compared to a low decitex yarn and high twist results in lower resistance compared to a low twist yarn. Conversely, high twist levels limit the copper’s penetration into the yarn resulting in uneven coating in comparison with low twist yarn. The amount of SP1/CB loaded on the yarn — approximately 2 grams of CB per kilogram were loaded onto the yarn because coating lower CB loadings lead to uneven copper deposition. The amount of copper deposited on the yarn before rewinding is important for uniform coating. The amount of copper deposited on the yarn after rewinding. Metal-coated textiles are breathable and lightweight compared to metal wires. The new production method allows efficient copper deposition on the polyester surface using a low-cost production process, and SPNano’s technology was demonstrated using an industrial dyeing machine. A hybrid metal-polymer filament may replace copper wire in signal wiring. 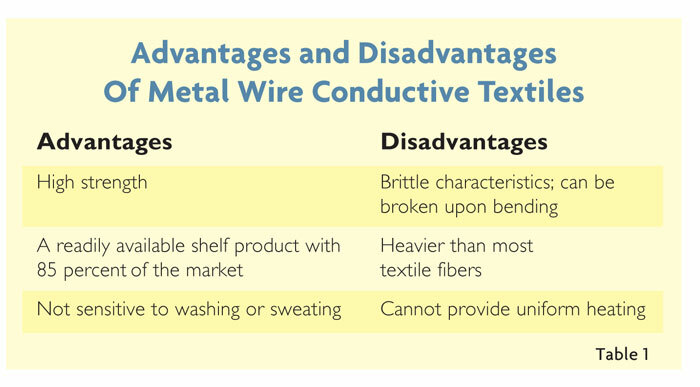 Coating thickness and evenness affect the electrical properties of the coated yarn, where a thicker coating layer typically leads to lower resistance. Editor’s Note: Senior Scientists Dr. Konstantin Press, Dr. Asa Eitan, Dr. Leonid Melekhov; and Chief Technology Officer Dr. Amnon Wolf work for Israel-based SP Nano Ltd.